Marmot Community internet site is a place for collecting news and data concerning marmots in the world wide web. If you investigate marmots, or just interested in this perfect animals, you are welcome here! Black-capped marmot at Kuril islands. (c) Andrey Lebed’ko. 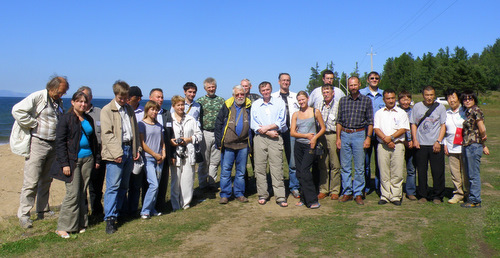 X meeting on Marmots of former Soviet Union’s countries took place between 22nd and 27th of August 2010 in Goryachinsk village, Republic of Buryatia, Russian Federation. Researchers from Russia and Ukraine and also special guests from France and Nepal, totally 34 scientists from 12 cities visited this conference. 54 communications devoted to different aspects of biology, conservation and sustainable use of marmots were collected, 28 oral reports were made and 7 posters were discussed. Here you can find annotation in Russian and English, here contents of theses in English is situated, and also you can download full text of theses (Russian only, .doc file). Most part of presentations were placed at International Marmot Network web site, you can find and download them here. Official web-site of Russian comission on Marmots investigation. After a long period silence this site starts working. Hope it will be usefull for communication. Idea of this site was born after VI International Marmot meeting in Cogne, Italy. There were a lot of nice people gathered by their interest to marmots, but between these international meetings they have no place for online communication. This site is supposed to be in English with exception of separate pages in other languages. 1. Any news of Marmot Community: meetings, conferences, publications and other activities. 2. Databank of persons, studying marmots. 3. Bank of abstracts and full articles about marmots in different languages. 4. Photobank of marmots, their habitat and other photos concerning studying process (procedures, equipment, and so on). NB! This is a private non-commercial project. I will highly appreciate your paricipation and possible help. All rights for the exposed data, articles and photos belong to their authors. Sending it here for publications you agree with their publication and possible use in non-commercial puposes.